The range features Tech21’s most popular designs, including the Evo Check, Pure Clear and Evo Wallet in new colours, as well as the first Evo Glass screen protector for curved screens. Tech21 works in collaboration with Samsung to design each of their products to ensure they work perfectly with Samsung devices. “As a ‘Made for Samsung partner, the protection that tech21 cases offer means that your Samsung Galaxy Note9 can look as good tomorrow as it does today,” said John Doughty, CEO. The Evo Check protects users phone without adding unnecessary bulk. With patented ribs and tech21’s FlexShock impact absorbing material, the Evo Check case absorbs impact energy and protects drop after drop from up to 3.6 metres, according to Tech21. The Evo Check is available in Smokey/Black, Orchid, and Ultra Violet at tech21.com, The Good Guys, Optus and Telstra stores for $54.95. Meanwhile, the Pure Clear case is made from BulletShield, an impact absorbing material used in bulletproof glass, to protect from drops of up to 3 meters. 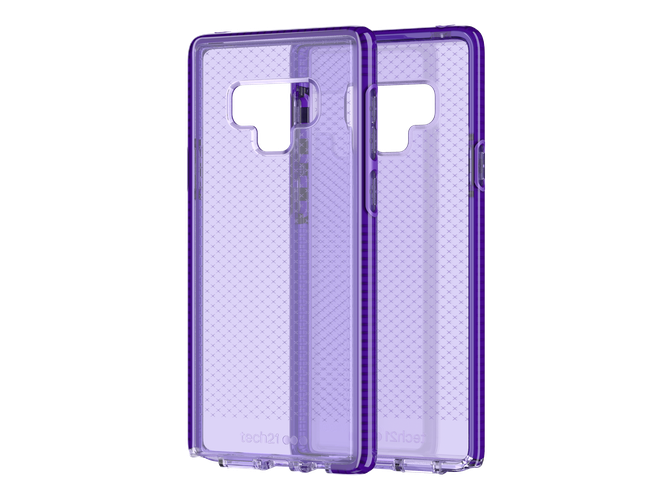 The case is up to 10 times more transparent than other clear cases and has anti-yellowing properties due to Tech21’s UV Protect technology. It is available from tech21.com, JB Hi-Fi, The Good Guys, Optus and Telstra stores for $54.95. Read more Which case should I buy for the Samsung Galaxy Note 8? The Evo Wallet keeps users cards accessible and their phone protected from drops of up to 3.6 meters. It's available in black from tech21.com, JB Hi-Fi, Harvey Norman and Optus Stores for $64.95.